"As infamous and popular as ever"
Judging from the massive (often rain-drenched!) queues that snake down Park Lane, the world renowned Hard Rock Caf� is as infamous and popular as ever. Deal: The children’s menu (�7.95) is cute with Cheesy Mac being one of the favourites: a huge, steamy plate of freshly prepared twisted macaroni in a creamy cheese sauce, served with crunchy garlic toast. Included is a drink but you can upgrade and have a thick chocolaty milkshake instead - a must! Are they pleased to see you? Once you get in (please book in advance! ), they are all charm and enthusiasm. 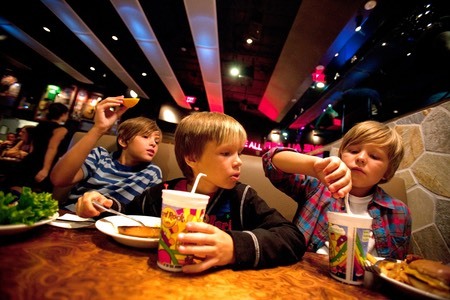 The kids are made to feel like royalty; their menus handed over with a flourish and gleaming smiles. Food: Classic burgers made with ravenous Americans in mind and mountainous salads that could feed a family of four! It's tasty, freshly prepared and expertly cooked. Would a veggie starve? If you don't eat fish, you may have trouble as its very meat/burger focused, but there is a vegeburger option. Facilities for the Kids: The Lil’ Rockers Club (for under 10s) means the kids can apply for a card to flash and get a complimentary hot fudge sundae. They also get to keep their cool drinking cup. Would you come again? Yes, off peak, it was too busy and manic. Kids verdict - "It was funky and very noisy... Hard Rock Caf� ROCKS!"